For many people including children the billiary tubing is choked with gallstones. There are over a half a dozen varieties of gallstones; most of which have cholesterol crystals in them. They can be black, red, white, green or tan coloured. The green ones get their colour from being coated with bile. At the very center of each stone is found a clump of bacteria, according to scientist, suggesting parasites might have started the stone forming. As the stones grow and become more numerous the back pressure on the liver causes it to make less bile. With gallstones, much less cholesterol leaves the body and the cholesterol levels may rise. Gallstones, being porous, can pick up all bacteria, cysts, viruses and parasites that are passing through the liver. In this way "nests" of infection are formed, forever supplying the body with fresh bacteria. No stomach infection such as ulcers of intestinal bloating can be cured permanently without removing these gallstones from the liver. Cleanse you liver twice a year! Choose a day like a Saturday for the cleaning, since you will be able to rest the next day. Take NO-FAT breakfast and lunch such as cooked cereal with fruit, fruit juice, bread and preserves or honey. NO BUTTER OR MILK. No fatty foods or food containing fats or oils. You may have vegetables with salt only. 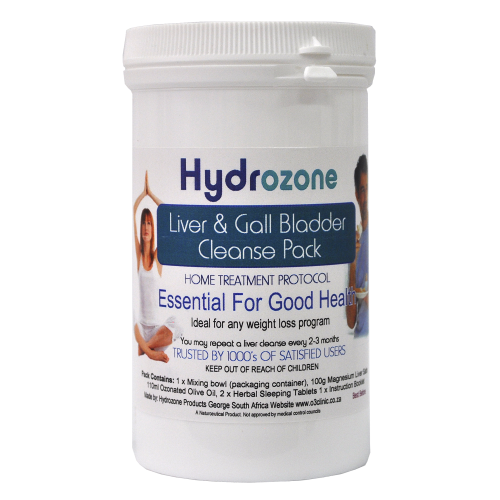 This will allow the bile to build-up and develop pressure in the liver. Higher pressure pushes out more stones. Do not eat or drink after 2'o clock. If you break this rule you could feel quit ill later. Get your Liver-Salt mix ready. Mix the tub of Liver-Salts with 3 cups water and pour into a jar. NB. This makes 4 servings of a 3/4 cup each. Put the jar into the fridge, when it is ice cold it will taste better. Drink one serving (3/4 cup) of the ice-cold Liver-Salt. You may also drink a few mouthfuls of water afterwards or rinse your mouth. Repeat by drinking another 3/4 cup of the Liver-Salt mixture. You haven't eaten since 2'o clock, but you won't feel hungry. Get your bedtime chores done. The timing is critical for success! Don't be more than 10 minutes early or late. Squeeze the grapefruit by hand into the measuring cup, and remove all pulp with fork. You may use 100% Grapefruit juice. You must have at least 1/2 (half) cup, more (up to 3/4 cup) is best. You may top it up with Sprite. Add this to the OZONATED OLIVE Oil. Close the jar tightly with the lid and shake hard until watery (only fresh grapefruit juice does this) Now visit the bathroom one more time! Drink the grapefruit/Ozonated Olive oil potion you have mixed. Take 2-4 Sleep-Aid tablets with the first sip (Sleep-Aid is optional to use), to make sure you will sleep through the night. Drinking through a large straw helps it go down easier. You may use cinnamon or brown sugar to chase it down between sips. You might fail to get stones out if you don't. The sooner you lie down the more stones you will get out. Be ready for bed ahead of time. As soon as the drink is down walk to your bed and lie down flat on your back with your head up high on the pillow. Try to think about what is happening in the liver and gallbladder. Try to keep perfectly still for at least 20 minutes. You may feel a train of stones traveling along the bile duct valves like marbles. There is no pain because the bile duct vales are open. Upon awakening take your third dose of Liver-Salt mixture. You can go back to bed. Take your fourth (the last) dose of Liver-Salt mixture. You may go back to bed. After 2 more hours you may eat. Start with fruit juice, half an hour later eat fruit. One hour later you may eat regular food but keep it light. By supper you should feel recovered. This is a picture taken by Gillian Milner from Plett showing some of the larger stones that were washed out the next morning after her Hydrozone Liver Cleanse. Expect diarrhea in the morning of the second day (Sunday). The ideal way to see what you are actually eliminating is to defecate into a white porcelain bowl or large white plastic bucket. The bowl or bucket is used instead of the toilet to also see the reddish crystals, which collect, at the bottom of the bowl (the stones float on top) and those crystals would ordinarily be lost somewhere at the bottomless hole in the toilet and you would have missed them. If you don't care to see the crystals - by all means, use the toilet. Another way would be to use the toilet and look into it for the stones with a flashlight. 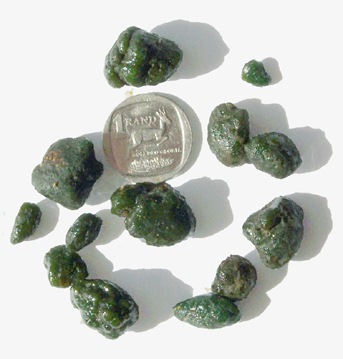 Look for the greenish kind, since this is proof that they are genuine gallstones and not food residue. Only bile from the liver is green. The bowel movement (if there is any) sinks, but gall and liver stones float because of the cholesterol content. Eventually, you may have to eliminate up to 2,000 stones, in several sessions, over a period of a year or so, before the liver is clean enough to rid you of all allergies or upper back, or other symptoms, permanently. The first cleanse may rid you of them for a while, but as the stones from the rear of the liver travel forward, they might give you the same symptoms again. 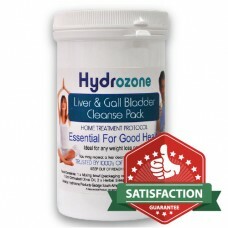 You may repeat this gallbladder/liver cleanse at two-month intervals until no more stones come out. Never purge when you are ill. Pregnant mothers should consult their pediatrician. The elderly should do this purge under the supervision of a health specialist. Drink lots of water during the second and third day. Sometimes, the bile ducts are full of cholesterol crystals that did not form into round stones. They appear as a "chaff" floating on top of the toilet bowl water. It may be tan coloured, harbouring millions of tiny white crystals. Cleansing this chaff is just as important as purging stones. How safe is the liver cleanse? It is very safe. Professionals and individuals have conducted thousands of liver purges, including many persons in their seventies and eighties. We have heard of nobody ending up in a hospital, and none reported pain. This liver purge could make you feel a little uncomfortable for a day or two thereafter. Stirred-up toxins are in solution, begging to be released. The above procedure contradicts many modern medical viewpoints. Gallstones are thought to be few, not thousands. They don't get linked to pains other than gall bladder attacks. It is easy to understand why this is thought: By the time you have acute pain attacks, some stones are in the gallbladder, are big enough and sufficiently calcified to be seen on X-ray, and they have caused inflammation there. When the gall bladder is removed surgically, the acute pain attack is gone, but bursitis, allergies, digestive problems and other symptoms recur and get worse. Stones are not thought to reside in the liver. If the liver is operated upon, only the largest and worst offenders can be removed - yet uncountable stones, gravel and crystals remain in the already clogged liver, which has not improved at all. The truth is self-evident: People who have their gallbladder surgically removed, still eliminate green, bile-coated stones with our liver purge. Anyone who cares to dissect these eliminated stones can see that the concentric circles and crystals of cholesterol match textbook pictures of "gallstones", exactly. In the highly unlikely event that you feel waves of pain reaching up to your throat, you might have a gallstone stuck in a bile duct. Clay-coloured stool is evidence of bile duct blockage. Epsom salts can relax that bile duct in 20 minutes. Take a heaping tablespoon in 3/4 cup of water but only on an empty stomach or you may feel quite ill. Taking a large dose of Valerian herb, 6 to 8 capsules four times a day, including bedtime, may also help to relax the duct. If you do get relief, you can be sure it was a spasm of the bile duct system. The magnesium in the Epsom salts relaxes spasms. It would be best to clean the liver a number of times (at two week intervals unless too ill) to try to dislodge the sticking gallstone. If this does not relieve the pain then you need to consult a medical professional. It is advisable to drink copious amount of water during the second and third day, when you eliminate the waste matter and body fluids as well. You have taken out your gallstones without surgery! I like to think I have perfected this recipe, but I certainly cannot take credit for its origin. It was invented hundreds, if not thousands, of years ago, THANK YOU, HERBALISTS! IF YOU HAVE ANY DOUBTS AT ALL WHETHER THIS PROCEDURE WORKS, OR WHETHER IT IS OF ANY VALUE, YOU SHOULD CONSULT A PHYSICIAN, WHO IS KNOWLEDGEABLE IN ALTERNATIVE AND NATURAL HEALING MODALITIES.